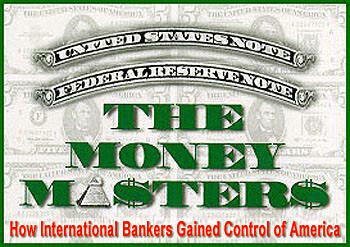 The machinations of the international banksters are becoming more apparent now as American taxpayers are being forced to bail-out the Federal Reserve banks to the tune of trillions of dollars. "Freedom to Fascism" is a documentary that answers questions such as "Is the Federal Reserve Bank part of the constitutional government or is it privately owned?" "Is there a law that requires everyone in the United States to pay income tax on their wages and salaries?" Determined to find the law that requires Americans to pay income tax, movie producer Aaron Russo (THE ROSE, TRADING PLACES, etc) sets out on a journey. Neither left- nor right-wing, this startling examination exposes the systematic erosion of civil liberties in America. Through interviews with US Congressmen, a former IRS Commissioner, former IRS and FBI agents, tax attorneys and authors, Russo connects the dots between money creation, federal income tax, voter fraud, the national identity card and the implementation of radio frequency identification (RFID) technology to track citizens. A striking case about the evolving police state in America. In his movie and in various interviews Aaron Russo describes his friendship with elitist Nick Rockefeller and what he learned about the plans of the international bankers. Everyone needs to see this movie! In fact, I believe that if enough people see this movie and then watch Aaron Russo's interview with Alex Jones, we could create a brighter future for ourselves and our posterity. To solve any problem one must first isolate the source of the problem. Mr. Russo did just that. Unfortunately, Aaron Russo died on August 24, 2007 after a lengthy battle with cancer. Anyone can stream the movie "Freedom to Fascism" on Aaron Russo's website at http://www.FreedomToFascism.com free of charge. You can also order the DVD of the movie at his website. You can find the movie on Google Video and YouTube or simply click on the "AMERICA" banner to the left. MONOPOLY MEN: After listening to Aaron Russo's interview with Alex Jones, click on the following link and watch this video entitled "Monopoly Men, Federal Reserve Fraud": https://vimeo.com/236967350. It appears that the DVD is available at www.nohoax.com or at www.toolsforfreedom.com . THE HIDDEN AGENDA: Continue your education by clicking on the link below to hear the alarming video testimony of congressional investigator Norman Dodd. Mr. Dodd headed the congressional committee to investigate the tax-exempt Rockefeller, Carnegie and Ford foundations and uncovered the hidden agenda of America's elitists. This is another must-see video! https://www.youtube.com/watch?v=gZqZGEBkX1s The DVD is available from the Reality Zone https://realityzone.com/. After watching the videos above please email this page to all your friends, relatives and the people on your email lists. If we all work together to quickly network this vital information we can create a positive change in the world. Truth is the ultimate weapon! I believe we have a small window in time to make a difference by disseminating the truth about the international bankers on the internet and through all other avenues of communication. Please do not wait or sit on this information. Get it out now! We haven't much time! Also, please support the producers of these videos by ordering their DVDs from their web sites. Thank You! As the videos above prove, the ultimate plan of the international bankers is to control all mankind through the "news" media and educational system and by imposing a cashless society upon us where everyone is "chipped". At present the people who are setting this agenda in place are using "convenience" as bait to gradually and quite subtlety ensare people into using the computer "chips" in cell phones, etc. Already some people have accepted being "chipped" in their bodies. How long will it take until these "chips" that are embedded in the human body become as commonplace as "smart" phones?